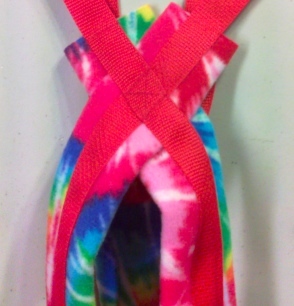 This Recreational Sled Dog Harness is RED poly webbing with a TYE DYE polar fleece. It will fit most dogs between 34 and 56 pounds. These are great harnesses for pulling sleds, rigs, scooters, someone on skates, and the like. My husband and I have used and raced in these same type harnesses for our own dogs for over 30 years. GSD IS NOT THE BREED WITH THE HIGHEST INCIDENT OF HIP DYSPLASIA.